We recently discovered the most convenient, least expensive way to get safe water anywhere. Perfect for camping, fishing, hunting, or your bugout bag. The last time I was parched—I mean ready to drink out of a raw mud puddle dehydrated—was when a friend and I were bowhunting elk in Idaho’s Nez Perce National Forest. We prepared for a 1-2 night bivouac, figuring we could save space and weight by leaving our pump purifiers at base camp and finding spring water to top off our water bottles. We started out with around a liter each. It was hot and dry (a no-burn rule was in place at the time), and by noon the following day we were out of water and getting in a bad way. Our hunt for elk had turned into a hunt for water. We eventually came upon a small stream and, foregoing the important boiling or chemical treating, we drank…and drank and drank, hoping we wouldn’t suffer the consequence. That, of course, wasn’t smart. Our guts survived drinking all the raw water, but we learned a hard lesson on that mountain: leaving your water purifier behind is not the way to save space and weight in the backcountry. 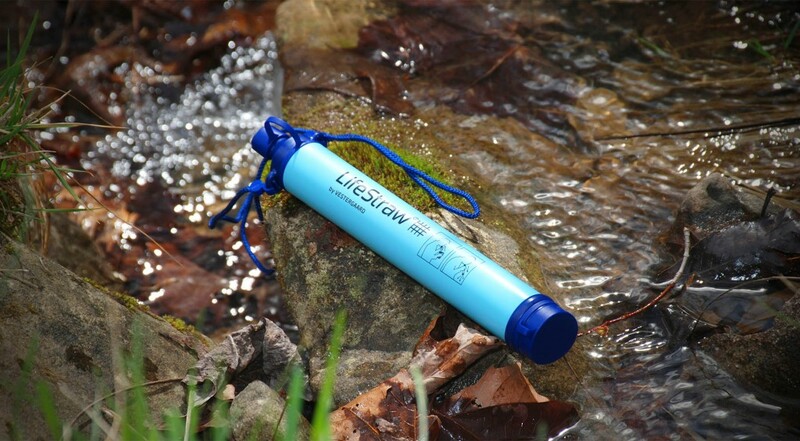 Recently, I came across the LifeStraw line of water purification products. These would have solved that “to take or not to take” dilemma. Originally developed as cost-effective means to provide potable water solutions for underdeveloped countries and humanitarian emergencies, the LifeStraw products I tested are perfect for anglers and hunters. 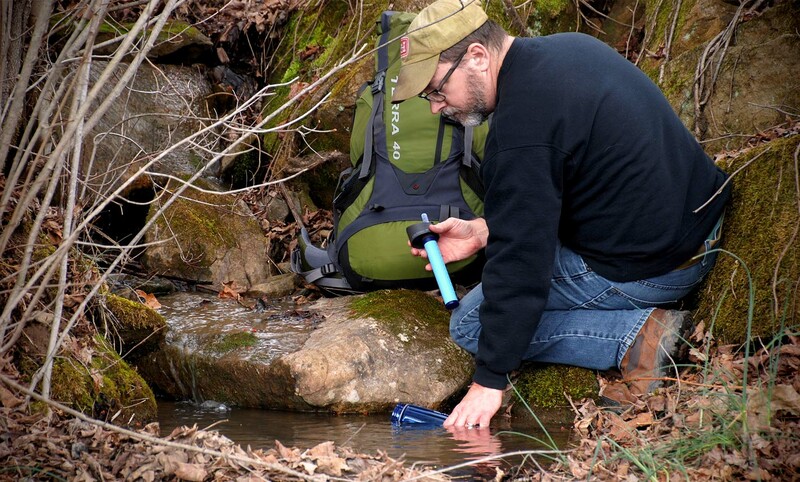 Whether you’re fishing miles up a headwater for the day or are on a two-week elk safari deep in the backcountry, there is a LifeStraw product to meet your needs. 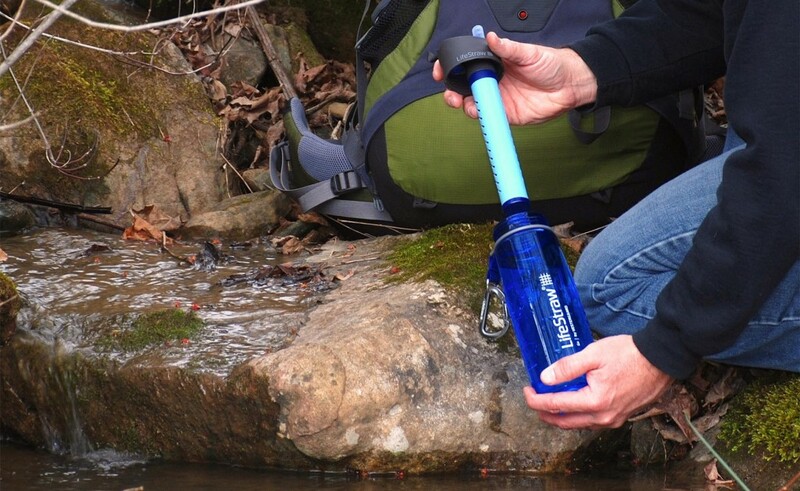 This is the LifeStraw product that first caught my attention. I do a lot of day-tripping throughout the year and like to travel as light as possible. I can take everything I need in a fanny pack, but space becomes a premium once you throw in a liter of water. 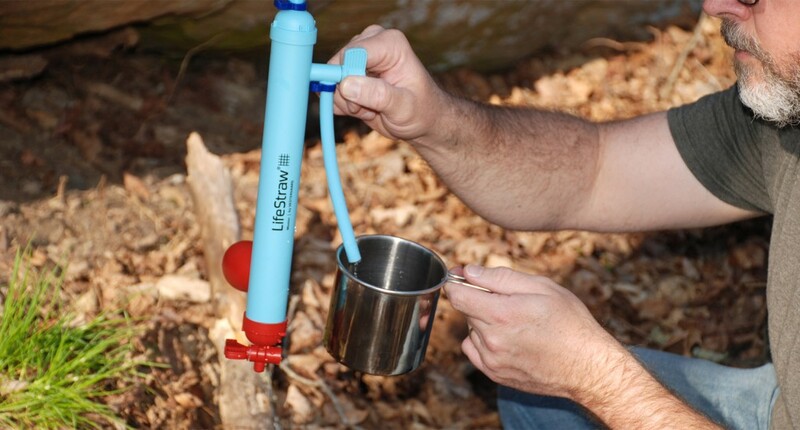 The LifeStraw Personal Water Filter puts that aggravation to rest. Weighing a scant two ounces, this filter fits easily into a fanny pack or you can hang it around your neck. Simply open the intake and draw caps and drink directly from any freshwater source just like you’re drinking through a straw. Aside from its portability, the LifeStraw Personal Water Filter allows you to get clean water from the most marginal water supplies. This includes small seeps, puddles, or any standing water source. The filter blocks 99.99+% of all waterborne nasties, and the small 0.2 micron filtration means even turbid (dirty) water can be rendered safe and palatable. What’s more, the low price and compact design makes this an ideal emergency filter to keep in your vehicle, your bugout bag, and your hunting or fishing packs. Sometimes, water sources—even small seeps and stagnant pools—aren’t close at hand. When you’re travelling in country where ground water is sporadic, the LifeStraw Go is your solution. The LifeStraw Go utilizes the same filtration system as the LifeStraw Personal Water Filter, but its 22-ounce volume allows you to carry the water with you. Simply unscrew the cap and filter assembly and fill the bottle with any available water source. When you need water, just flip up the mouthpiece and drink. 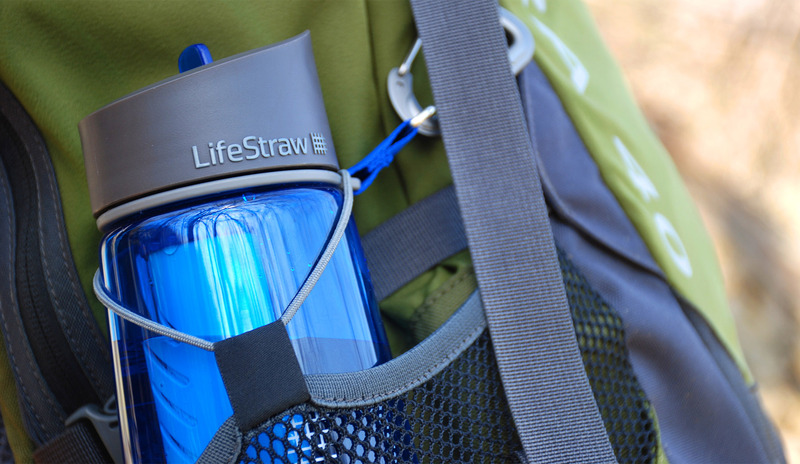 A rotating collar with a carry loop and carabiner assembly allows you to secure the LifeStraw Go to your pack’s daisy chain loops. It’s also sized to fit the water bottle pockets of most backpacks. If you’ve ever headed into the wilderness for an extended hunting or fishing trip, you know that packing in water is out of the question. 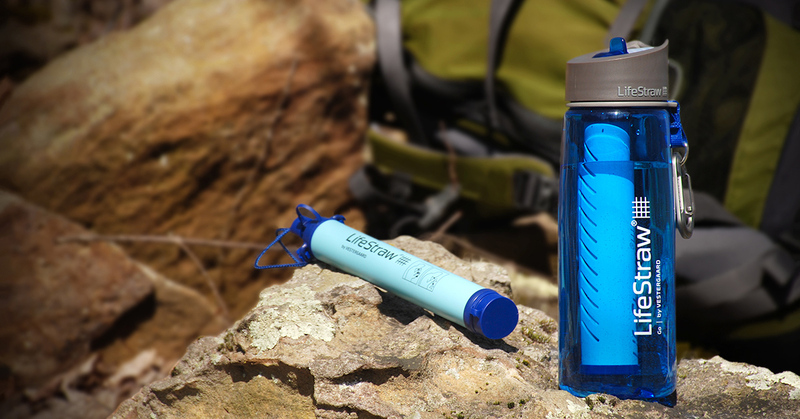 You need a steady, high-volume source for your basecamp needs, and that’s where the LifeStraw Mission comes in. Most of us set our base camps near a water source, such as a lake or stream. The LifeStraw Mission capitalizes on those high-volume sources by letting you “bag” up to 12 liters of untreated water. 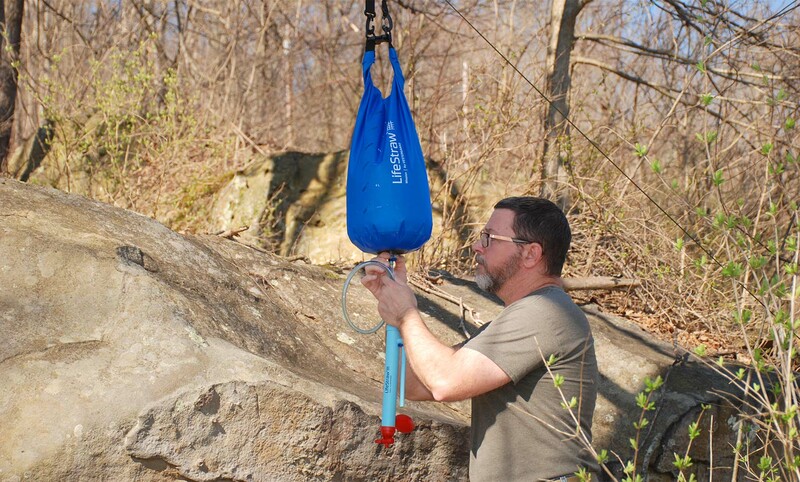 Once filled, the LifeStraw Mission closes like a dry bag, only instead of keeping water out, you’re keeping water in. This is a gravity filtration system. At the bottom of the bag is a pre-filter. The primary filter connects to the pre-filter via a hose. Once the bag is filled, close it up, hang it from a tree limb, and connect the primary filter to the pre-filter. The primary filter has a blue “safe water” tap that you open and close to obtain filtered water. You use the red “dirty water” valve and primer bulb to backflush the unit and to remove any air that may get into the system. Because this is a gravity fed system, clean-water outflow is somewhat slow (around 9-12 liters per hour). Although there are situations where a pump filtration system is convenient, the LifeStraw line covers all the bases. They’re light, inexpensive, and you can match them to nearly every outdoor activity—wilderness fishing, single- or multi-day bivouac hunts, or spike camp hunting. We only wish we’d discovered them sooner.